Hollybrook Pond lies on the west side of Hollybrook Park Road and is is open to public access on it's northern and eastern edges. The pond attracts birds, such as ducks and moorhens, sticklebacks, smooth newts & frogs, dragonfly and other invertebrates such as water boatmen and freshwater shrimps. The pond was constructed before there were many houses on land either side of the pond, which much of the water draining down from the Chalet Hill area to fill up the pond and then overflow into the River Deadwater. As new houses have been built, this drainage system has become blocked and diverted so, at times of little rainfall, the pond dries up. 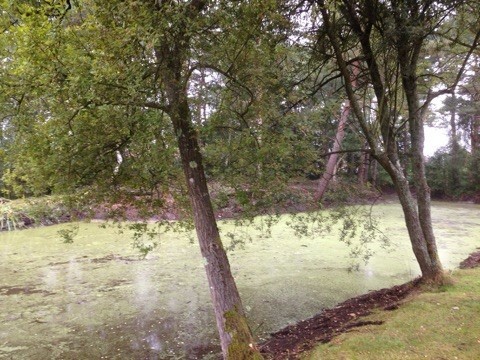 The pond was registered to the Council in 1991 with only a limited amount of carried out over the following years. 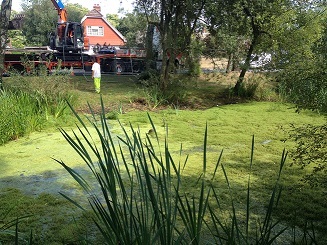 A 10 year management plan was drawn up in 2012 to manage the pond edges, woodland and island as well as improve the quality and level of water in the pond. 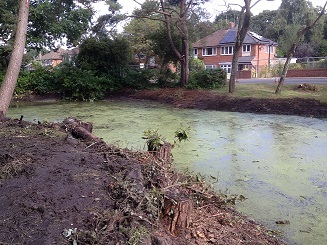 In 2015, in response to residents' please, a working party was set up with the Council and Deadwater Valley Trust to investigate how this much local local amenity could be improved.